Stephen Crane in Athens, May 1897. Image reproduced from ©The Crane Log: A Documentary Life of Stephen Crane, 1871-1900, by Stanley Wertheim and Paul Sorrentino (New York: G. K. Hall, 1994), page 256. Original in the collection of Stanley Wertheim. 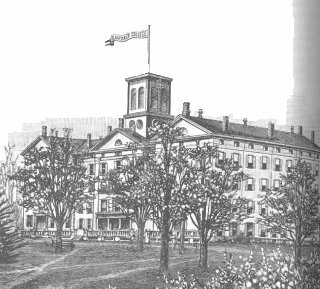 Photo of Claverack College and Hudson River Institute, the school which Crane begins attending in January 1888. Image reproduced from ©The Crane Log: A Documentary Life of Stephen Crane, 1871-1900, by Stanley Wertheim and Paul Sorrentino (New York: G. K. Hall, 1994), page 256. Original in the collection of Stanley Wertheim.